Tufnut Two-way Tamperproof Security Nuts are installed or removed with a standard box spanner and the aid of an extra Tufnut. 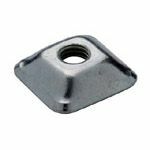 These tamper resistant nuts provide a simple, low cost tamper proof fixing for indoor or outdoor use. Easily installed using a standard or adjustable spanner, the unique Tufnut is suitable for a wide range of security or anti-vandalism uses. To install Tufnut you`ll need a suitable size spanner or adjustable wrench and an extra Tufnut as shown here. Simple in concept, Tufnuts are suitable for a wide range of applications. Once installed however, these nuts are difficult to remove without the aid of an extra Tufnut and an appropriate size spanner. Current applications include use in the assembly of park railings to protect children`s play areas, but these versatile nuts can be used almost anywhere that a security or anti vandal fixing is required. 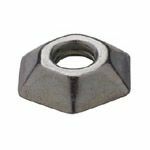 Tuf-nuts are available from stock, manufactured from Bright Zinc Plated Hardened Steel.